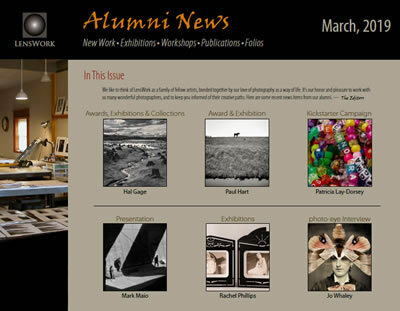 A monthly update on news and happenings in the LensWork Community of photographers. Download or Subscribe - FREE! 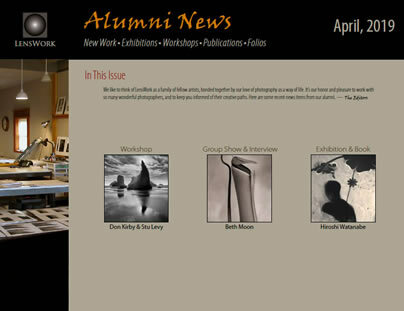 The LensWork Alumni News provides news from our shared corner of the photography world in a single format, a single PDF. The selection of photographers included are those whose work you already have enjoyed through their appearance in LensWork or LensWork Extended. People and work that you know you’ll be interested in! You can download the current or past issues using the links below, or sign up for the RSS feed to be notified as each issue is available.